It doesn’t get any more american than apple pie. I’m finally getting around to posting my recipe on apple pie that I always use during the holiday season. What separates this from other apple pies is using the yellow delicious apples or yellow opal. To me they have a sweetness and flavor that is perfect for apple pie. I used the left over pie crust to do a lattice design on the top. Feel free to top with a whole layer of tart dough or use a streusel topping. I’ve used both and either way you can’t go wrong. Here is the recipe for this straight forward apple pie recipe, but one that will definitely be in your recipe file. 6-8 big Yellow delicious apple or opal peeled and sliced. Sprinkle turbinado sugar on top. Using the food processor add flour to the bowl along with butter and salt. Then turn the processor on for 30 seconds until the butter has been combined. Drizzle in the cold water until the dough has come together. Normally now you put the crust into the refrigerator to let the dough come together as it gets cold. I don't like when my dough is so cold I can't roll it and usually I am in a rush. 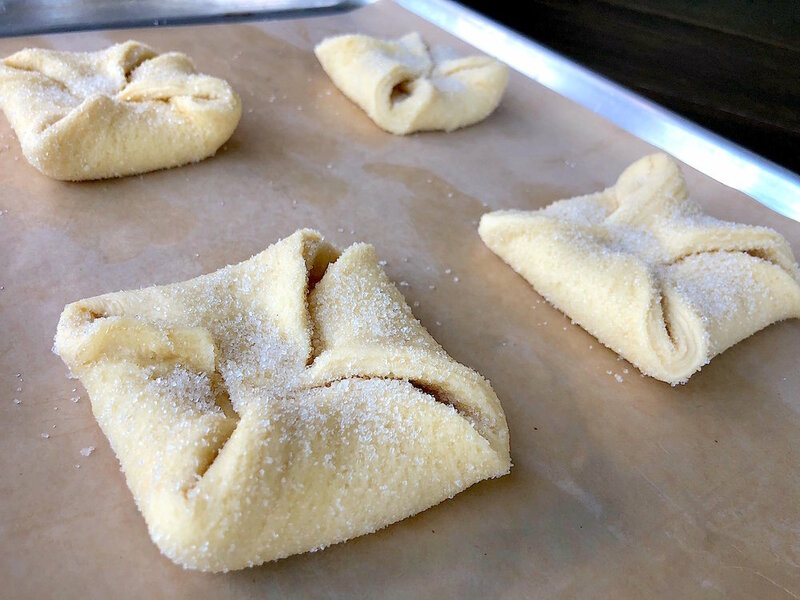 If you can put the dough in the freezer for 15 to 20 minutes it will really help; if not simply take the dough and put a light dusting of flour onto the parchment paper and place the dough on top. Then dust flour on the top of the dough and put a second piece of parchment paper on top of the dough. With a rolling pin roll out your dough to a thin crust consistency. Take your tart mold and carefully place your tart dough inside the mold. Using a rolling pin roll the pin over the mold to trim off any excess dough. With a fork prick the dough all over. Place a piece of parchment paper on top of the tart and add pie weights or dried beans to weight the paper down on top of the tart. Place in the oven and bake for 15-18 minutes. Take out the pie tart and take off the parchment and save the weights for another baking day. The Best pecan pie recipe! Are you looking for the secrete to the best pecan pie ever! Look no further because I’ve got the answer for you and it isn’t something that will take hours and hours in the kitchen. It really isn’t that different than any other recipe. Find the best ingredients and combine them with great flavor and technique. This is what I made for Thanksgiving weekend and it was definitely an indulgence. My secrete to the best pecan pie is fresh vanilla bean and doubling or tripling in some cases the amount of pecans in most other recipes. In this pecan pie there is not small layer of pecans on top and then a middle section of gel ( custard) and then crust. The custard or gel in the middle is filled with pecans and vanilla along with other flavors. So the secrete is out of the bag, and now it is time to go and try for yourself. Here is the recipe I hope you enjoy it! Place all the ingredients into a food processor except for the egg. Puree for 20 seconds and then add the egg to the processor while it is still running. Puree for another 10 seconds until the dough comes together. Wrap in parchment and place in the refrigerator for 30 minutes. Roll out dough on a lightly floured surface with a lightly floured rolling pin into a 12-inch round and fit into a 11-inch tart shell. Trim edge, leaving a 1/2-inch overhang. Fold overhang under and lightly press against rim of shell and remove the excess dough. With a fork prick the dough all over. Place a piece of parchment paper on top of the tart and add pie weights or dried beans to weight the paper down on top of the tart. Place in the oven and bake for 22-25 minutes. Take out the pie tart and allow to cool completely. Take off the parchment and save the weights for another baking day. Meanwhile, melt butter in a small heavy saucepan over medium heat. Add brown sugar, whisking until smooth. Remove from heat and whisk in corn syrup, vanilla, zest (optional), and salt. Lightly beat eggs in a medium bowl, then whisk in corn syrup mixture. Put pecans in the bowl with the syrup-egg mixture and mix well then pour in pie shell. Bake on sheet pan lined with parchment paper until filling is set, 35-45 minutes. Cool completely. Place cheeses and sugar in a stand mixer with a paddle attachment whip for 3 minutes. Then add vanilla, and almond mixing on low. Finish with adding the eggs one at a time. Mix until a smooth batter is formed. Finish with the creme fraiche. I lined a spring form pan with parchment paper and par baked the pecan shortbread see recipe underneath, then poured the batter on top. Bake the cheesecake in a 350 degree oven for 20-25 minutes or until the toothpick comes out clean. Allow to cool to room temperature and then place in the refrigerator until ready to serve. Go here to so see the recipe and just add the Hazelnut from this recipe. I placed the dough in a spring form pan lined with parchment paper and par baked it for 25 minutes. Place all the ingredients into a small sauce pot and turn on medium low heat. Whisking continually until the curd starts to thicken. Should take about 10 minutes or so. Strain into a bowl and cool for about 10-15 minutes. Once cooled slightly, pour the curd over the top of the cheese cake and using an offset spatula smooth the top off. Place the cake back in the refrigerator until the curd is set and completely cold. Take the pre-baked feuilletine cookie and place 1 cup into a plastic zip lock bag. Using a mallet or your hand crush the cookies into the bag (you don’t want to pulverize them into powder you still want a little texture to them). Then using a round cookie cutter or a knife cut desired shapes from the cheesecake and take crushed feuilletine and place around the cake. Serve and enjoy! Jp loves biscotti, and Eloise wanted me to make some for the week of his birthday. I also love biscotti and I don't think I had ever made it before up until this point. I thought I could make a good dessert out of the leftover biscotti that hadn’t been eaten yet. During the summer months in Malibu we have these wonderful mulberry trees that normally produce exception mulberries. This year we didn’t get a good crop and I happen to get these from the local farmers market. These mulberries I think were of turkish or pakistani variety and were very sweet. Here is the recipe using basically nothing but leftovers; ice cream, sorbet, and biscotti with fresh fruit! Here is the recipe I hope you enjoy it! Stir together sugar, butter, amaretto, and extracts in a large bowl, then stir in almonds and eggs. Stir in flour, baking powder, and salt until just combined. Chill dough, covered, 30 minutes. Using moistened hands, halve dough and form 2 (16-by 2-inch) loaves on an ungreased large baking sheet. Bake until pale golden, about 30 minutes. Carefully transfer loaves to a rack and cool 15 minutes. Cut loaves into 3/4-inch slices with a serrated knife. Arrange biscotti, with a cut side down, on a clean baking sheet and bake until golden, 20 to 25 minutes. Transfer to rack to cool completely. Then take a few pieces of the biscotti once completely cooled and place in a plastic ziplock bag with as little air as possible inside. Using a mallet crush the biscotti inside the bag, leaving rough pieces. Set aside for later use. Place water and sugar in a pot. Bring to a boil and cook for 2 minutes. Then cool slightly and place in a blender with the 2 cups of blueberries. Puree until smooth, and the lemon juice, then chill until completely cold. Place in your ice cream maker according to their instructions. Place in an air tight container and place in the freezer until you need it. Put all the ingredients in a small sauce pot. Bring to a boil stirring consistently and cook for 5-7 minutes. Then pour gel into a half sheet pan or baking dish. Place in the refrigerator until the agar has set. Then take a knife and cut the set gel into sections. Place it all into a vita mix and puree until smooth. Pour into a squeeze bottle and set aside until ready to use. On a plate add some of the strawberry gel in any design you want. Then add a hand full of the crushed biscotti on to the plate. Add the sorbet and ice cream. 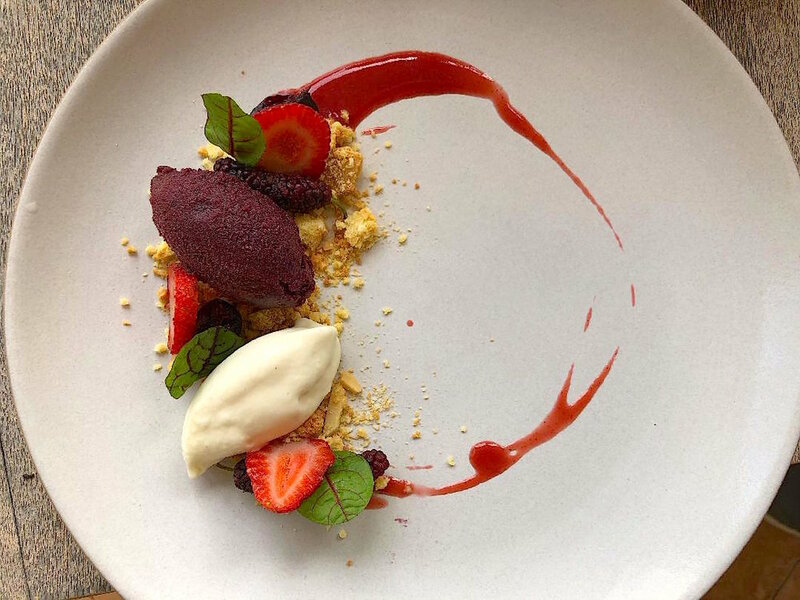 Finish with fresh strawberries, mulberries and red sorrel. Serve and enjoy! Sometimes you have to go with what works and what is delicious. There are classic recipes and combinations for a reason, because they delicious. Of course this is my interpretation of the classic s'mores. I served a small scoop of vanilla ice cream that isn’t shown in the picture. Jp said "this was one of the best s'mores he's ever had" The addition to this recipe is the feuilletine cookie and the honey ganache. Incorporate the meringue and it is a great version to the classic. Here it is I hope you enjoy it! In a stand mixer with the paddle attachment cream butter and sugar together. Add molasses, vanilla bean, egg, and milk. Mix well, scraping the sides. Then add the flour and mix until well incorporated. Add a few spoonfuls of the batter onto a silicone mat and using a offset spatula spread the batter very thin. Then place in the oven to bake for 8-10 minutes until dry and crisp. Take out and allow to cool completely. Then break up into pieces and store in an air tight container. Take a mini ice cream scoop and scoop out balls of the honey ganache once firm. Place in the refrigerator 20 minutes just to firm up a bit. Then place the meringue in a piping bag with a plane tip. Pipe in a circular motion around the ball of chocolate ganache. Then carefully using a spatula place it on top of crushed graham crackers on the bottom of the plate. Using a torch, brown the meringue and place pieces of the feuilletine around the smores. Serve with a scoop of vanilla ice cream if desired. Serve and enjoy! Here is the classic meringue dessert. Meringue is actually not one of my favorite desserts but this one was really exceptional. I didn’t grown up on meringues and that is probably one of the reasons it isn’t my top dessert. My wife on the other hand loves meringue and gets it when ever she can. We just got back from Italy where she ordered a similar dessert twice. Pavlova is normally a meringue that is baked and the outer shell of the meringue is hard and crunchy while the center has that gooey, marshmallow type consistency. Here is the recipe I hope you enjoy it! Add egg whites and vanilla to a stand mixing bowl. Beat the egg whites until soft peaks start to form then slowly add the sugar to the egg whites and beat until the meringue is stiff and shiny ( about 3-4 minutes. Then fold in the cornstarch and lemon juice. Once well incorporated place the meringue into a pastry bag with a plain tip. Then on a sheet pan lined with parchment paper you can pipe out individual meringues in a circular motion. Place the sheet pan in oven and immediately turn down to 300 and cook for 1 hour and 15 mins. Turn off oven and allow to cool completely in the oven. Should look something like this. Bring small pot of water to a boil, place the sliced buddha hand in the boiling water and blanch for 3 seconds. Strain off the water. Repeat the same step two more times blanching and staring the buddha hand slices. after 3 times add the measured water and sugar and bring to a boil. Add the buddha's hand blanched slices to the pot. Cook for 5-10 minutes and then pour into a preserve jar seal properly. Place sugar and water in a pot and bring to a boil. Turn down to a simmer and cook for 5 minutes. Turn off the heat and cool completely. Then puree with oranges and zest. Strain the mixture if you desire. Then pour into a ice cream maker and follow your instructions. Take out and place in a container in the freezer. Place a spoonful of anglaise on the bottom of the plate. Add one pavlova and place on top. Add orang segments, and preserve around the meringue. Add the sorbet on top. Finish with leaves of basil. Serve and enjoy! Who doesn't love pop-tarts? Well this is my version of a pop tart. It's basically a filled pie crust but with strawberries at the height there sweetness it is a recipe that not only anyone can make but that everyone will love. In the summertime it is hard not to over buy fresh fruit at the farmers market. When all the farmers are giving out fresh sample of their delicious fruit and they give you price breaks on the more you buy it is hard not too. Well, that was the case on this particular occasion, so I was forced to make some amazing strawberry jam that was a low sugar since the strawberries were so sweet naturally. Here is the recipe, I hope you enjoy it! For the dough, Preheat Oven to 375 degrees. Using the food processor add flour to the bowl along with the salt. Pulse a few times to combine well. Then turn the processor on and begin to add all the butter a tbsp. at a time. Once the butter has been combined. Add egg and drizzle in the cold milk. Normally now you put the crust into the refrigerator to let the dough come together as it gets cold 45 minutes or If you can put the dough in the freezer for 15 to 20 minutes it will really helps. Then simply take the dough and put a light dusting of flour onto the parchment paper and place the dough on top. Then dust flour on the top of the dough and put a second piece of parchment paper on top of the dough. With a rolling pin roll out your dough to a thin crust consistency in the shape of a rectangle. Then with a knife or pizza cutter cut the dough into even rectangular shapes. Place a spoonful of the cooled strawberry jam filling in the middle of the of dough. Brush the edges with egg wash. Then take another piece of dough and place on top. Pinch the edges to seal and then with a fork press the dough all over the edges and prick the top of each pie. Place a piece of parchment paper on a sheet pan and place the finished pies on top. Once all are done brush with more egg wash. Place in the oven and bake for 22-25 minutes or until golden brown. Take out the pies and allow to cool completely. In a bowl mix together cream cheese, jam, and powdered sugar until smooth. Then once the pop tarts have cooled completely top the tarts with the cream cheese mixture. Add sliced strawberries on top and your done! Serve and enjoy! Plum meringue tart you say? Never heard of it! Me either, I'm sure someone had made this but I've never heard of it or seen it. The thought behind this is actually very simple. We have plum trees here in Malibu and they are some of the best tasting plums I've ever had. If you let them ripen like you should they have a certain sweetness to them that isn't completely tart. Lemons are very similar tasting profile in my mind. They have a natural sweetness to them but they are very tart. Why not exchange the fruits for the classic lemon meringue tart. Add a little vanilla bean to the mix to help with some of the tartness and you have one of the best tasting tarts ever. Everyone said it was really amazing, so delicious. Again, almost every single recipe depends on how great your ingredients are. If you have plums that really have little to no flavor, your tart is going to have little to no flavor. Going to farmers markets and being able to taste different varieties of fruit would really go a long way for this recipe. Or if you like me and have access to a tree in your backyard and it has years of maturing behind it, the result is truly amazing. With that being said it really is an easy dessert. I hope you enjoy it! Place flours,sugar, and salt into a food processor. Pulse a few times and then add the butter. Keep the processor running until butter has been incorporated. Then while the food processor is still on start pouring in the ice water until a smooth dough has formed. Take the dough and divide into two equal parts. Wrap in parchment paper and chill for 30 minutes. Then take out and roll the dough in between two pieces of parchment paper into a 1/4 inch thick. Then place dough into your tart mold and bake for 15 minutes. Place all the filling in a mixing bowl and place over a water bath. Stir softly until the mixture comes to 140 F. Then strain the mixture into the tart crust. Place the tart into the oven and bake for 25 to 30 minute or until it is firm with a little wiggle. Set aside and let it cool completely. Place in the refrigerator until ready to top with the meringue. In mixing bowl heat eggwhite and sugar over water bath until it reaches 160 F. Then immediately place in a stand mixer and whip for 5 minutes or until cool. Put the meringue in pastry bag and pipe in a consistent motion on top of the plum tart. Then with a torch, brown the top of the meringue. Add the blueberries, plums, and mint. Serve and enjoy the fresh taste of plums! This might be one of my favorite cakes I have made in recent times. Who doesn't love honey! And who doesn't love a moist cake that is saturated with cinnamon, honey, and citrus. Add some summer fruit to the dish along with some creamy ice cream and you have an unbeatable combination. This is a slam dunk if you have a sweet tooth and can deal with the components. This recipe can be broken up into parts so you don't feel like you have to accomplish all this in one day. Also the description looks and might sound complicated but in reality it really isn't that hard. 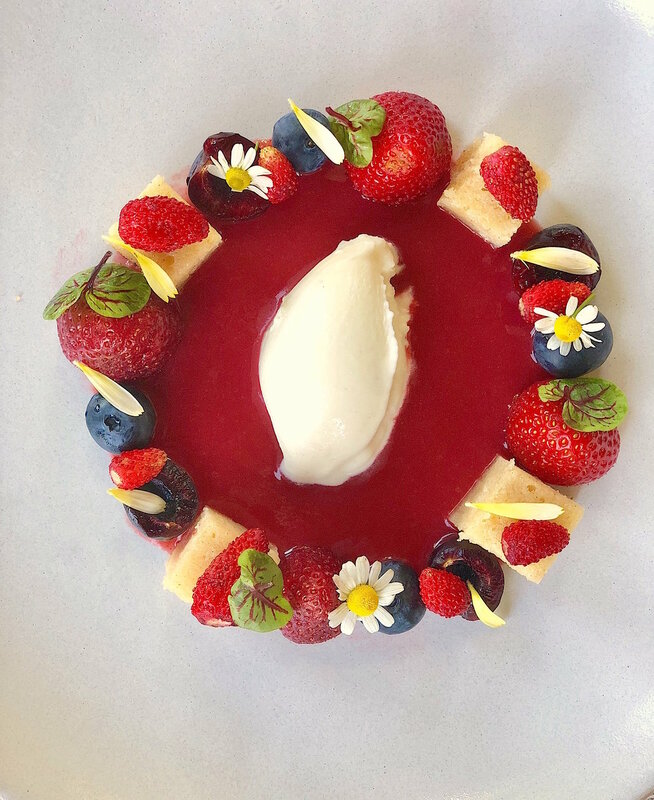 Here is the recipe for a fantastic summer dessert! In a small sauce pot heat milk over medium heat then add in the sugar, trimoline, glucose, until dissolved. Then pour the milk into a bowl and whisk until smooth. Strain through a strainer into a bowl with an ice bath. Add lemon juice and salt to season. Cool completely then pour into your ice cream maker and use according to your ice makers directions. When done place in a air tight container in the freezer until ready to use. Preheat oven to 350 degrees. Grease and flour a 9 inch square pan. Combine the dry ingredients ( flour, starch, baking powder, salt, cinnamon, lavender, and lemon rind). Set aside. In a large bowl, cream together the butter and 3/4 cup sugar until light and fluffy. Beat in the eggs one at a time. Beat in the flour mixture alternately with the milk, mixing just until incorporated. Pour batter into prepared half sheet pan. Bake in the preheated oven for 15-20 minutes, or until a toothpick inserted into the center of the cake comes out clean. Allow to cool for 10 minutes, then cut into desired shapes. Pour honey syrup over the cake. In a saucepan, combine honey, 1 cup sugar and water. Bring to a simmer and cook 5 minutes. Stir in lemon juice, bring to a boil and cook for 2 minutes. Combine all the ingredients in a small pot except for the chamomile and bring to a boil. Turn down and simmer for 10 minutes. Then puree until smooth. Add the chamomile and let it steep for 10 minutes. The discard the chamomile. Place in the refrigerator until completely cold. Add a few pieces of cake around the middle of the plate. Add alternating strawberry, blueberry, and cherry in-between each piece of cake. Add a some wild strawberries on top of the honey cake. Then add a some of the flowers and herbs for garnishes. Ladle some of the sauce in the middle of the plate and then finish with a scoop of the creme fraiche ice creams. Serve and enjoy! Simply summer! That sums up this recipe in a few words. When it is blistering hot outside and you want to create a dessert that doesn't mean slaving all day in the kitchen, this is your go to dessert. Puff pastry, almond paste, and fresh stone fruit. That's really all there is to this recipe. It can be eaten all times of the day and and doesn't need to be made specifically for dessert, brunch would also be great. 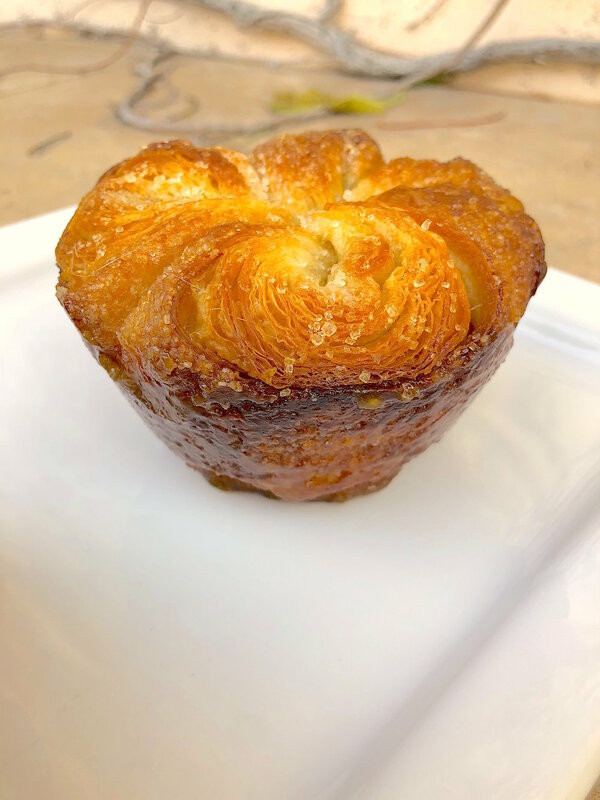 You can purchase already perfect size square puff pastry so you don't even need to worry about cutting it. Make the almond paste place in the center of the pastry, add the fruit, egg wash and almonds. Bake and your done! Here is the recipe I hope you enjoy it! Place almond meal and sugar in a food processor and puree for 30 seconds. Then while the machine is running add the butter a tbsp. at a time. Once all the butter is in add the eggs again while the machine is running. 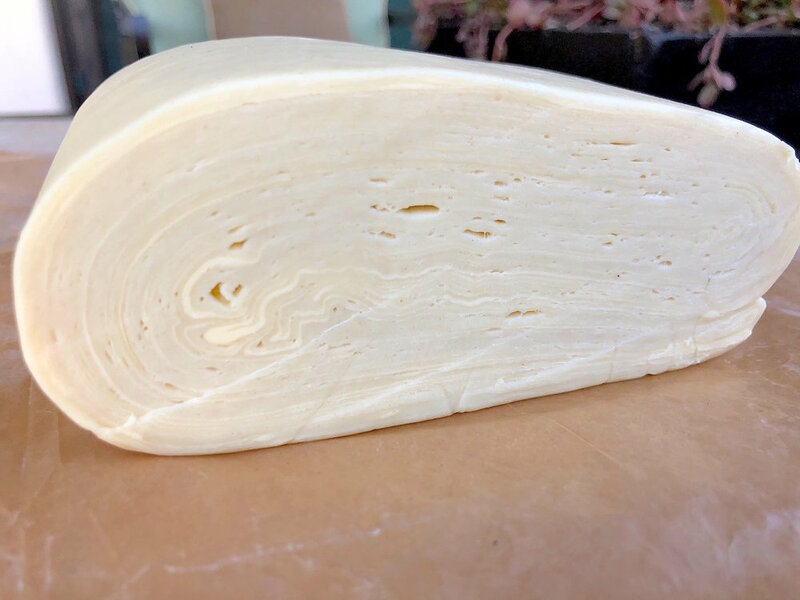 You can stop to scrape the sides if there are any clumps but once the eggs have been added you should have a really smooth and creamy almond cream. Finish with both the vanilla and almond extract. I normally double this recipe which gives me extra laying around that I can make something else with. But you should have enough to fill the tart with just one batch. Place the almond cream in a plastic pipping bag and place in the refrigerator to firm up a bit (but not too cold where you can't pipe it out) . Take two sheet pans lined with parchment paper and place 6 puff pastry squares on each pan. Take the pastry bag filled with almond cream and pipe out 1 line of almond paste down the center of the puff pastry. Then take sliced fruit and place on top of the almond cream. 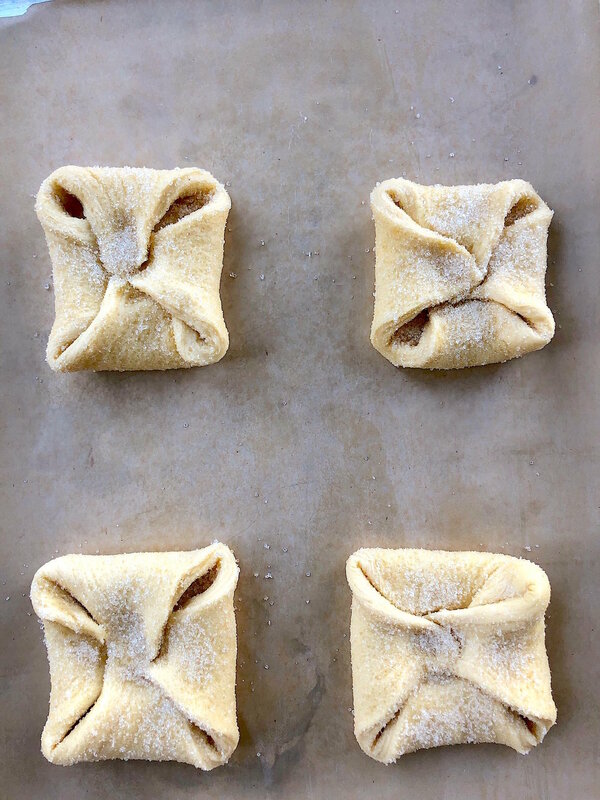 Continue the same process with all of the puff pastry squares. Take egg wash and brush around the edges of the pastry. Top with almond slices and place in a preheated oven at 425 degrees. Cook for 20-25 minutes until golden brown. You might want to rotate and readjust from the bottom rack in your oven to the top rack with other pan for even cooking. Once golden brown take out and cool completely. Serve and enjoy! Ginger snaps are one of Jp's favorite cookies. He likes cookies that are thin and crunchy and I like soft chewy one 99% of the time. This recipe was perfect mix because they are crunchy on the outside and soft and chew on the inside. Not much more to ramble on about, this couldn't be more straight forward. Here is the recipe I hope you enjoy it! For the Cookies, heat oven to 375°F. Spray sheet pans with cooking spray, or line with cooking parchment paper or silicone baking mat. In stand mixer, beat brown sugar, shortening, molasses and egg with paddle attachment on medium speed. Until well blended. Stir in remaining ingredients except granulated sugar. Shape dough by rounded teaspoonfuls into balls. Dip tops into granulated sugar. On cookie sheets, place balls, sugared sides up, about 3 inches apart. Bake 10 to 12 minutes or just until set. Immediately remove from cookie sheets to cooling rack. Serve and enjoy! This summer we took a wonderful trip to Colombia. While there we visited both Cartegna and Medellin. Both cities we really enjoyed. Cartegna was a beach city very much like visiting some of the tropical "islands". Medellin was a beautiful city that was nestled in between the mountains and it was like my father-inlaw described it, "they built a city in the middle of the jungle". Very green and lush. One night in Cartegna I think I had one of the best ceviches I've ever had, coconut ceviche. It was really amazing, so smooth, refreshing, and addicting. I don't think there was much to it other than the fish was probably just caught off the coast, the coconuts were probably just picked along with limes and cilantro. It was really spectacular! Here is my attempt at it, I hope you enjoy it! Place the juice of the all the citrus in a large bowl. Add diced serranos, cilantro, and 2 tbsp of salt. Season all the fish really well with salt and place in the bowl. Make sure that the fish is completely covered in the citrus juice. Place in the refrigerator for at least 3 hours. Then after 3 hours you can add a can of coconut milk to the ceviche. Let it marinate for another 45 minutes and at this point the ceviche should be ready to serve, but it can sit for longer if need be. To serve, place some sliced serranos, radishes, and cilantro flowers. Serve and enjoy! 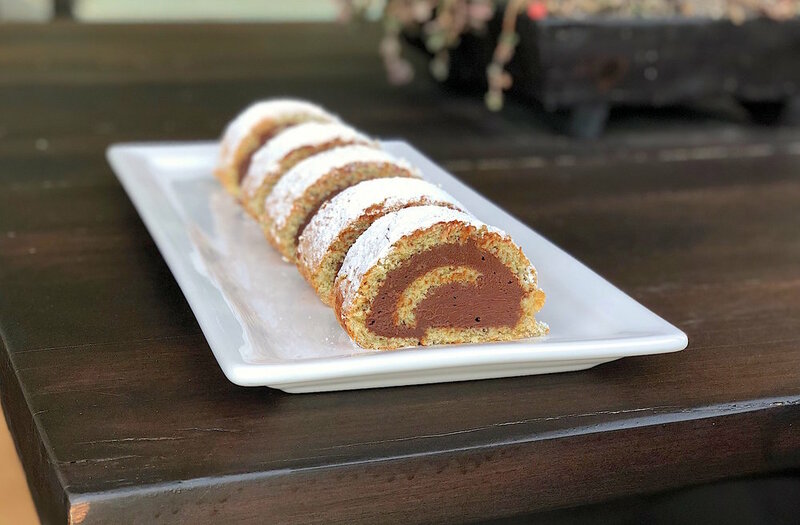 Here is a classic dessert that I decided to take a stab at. It really is a delicious dessert in the height of summer when the strawberries are extra sweet. This is normally made in individual servings in pastry shops. I had a large cake ring and decided to use that instead of making several individual ones. Because of the size and the weight of what I added on top it was a little top heavy, as you can see slightly in the picture, but that didn't effect the taste and flavor. 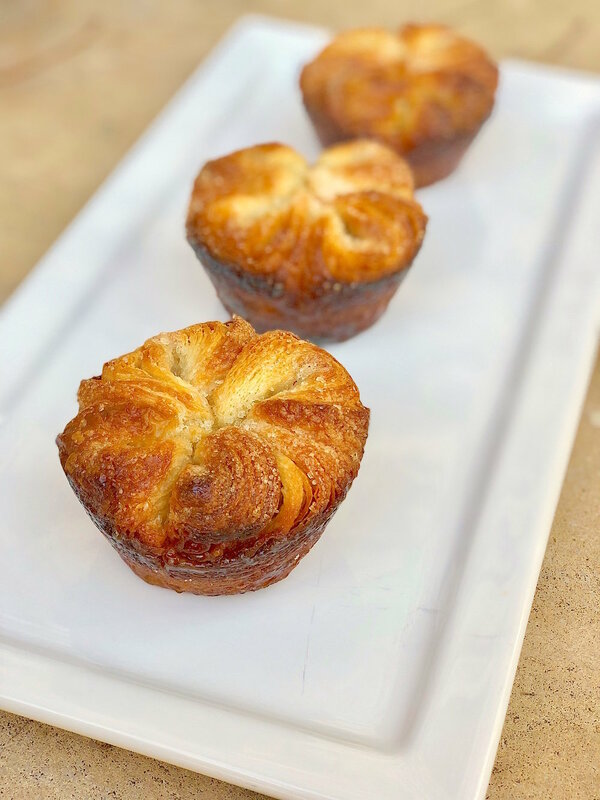 This is french pastry 101, if you go to any patisserie in the summertime you bound to find these in their pastry case. Here is the recipe, I hope you enjoy it! Place egg yolks, vanilla, and 1 cup of sugar into a stand mixer. Whisk until thick and pale yellow about 5 minutes. Then add the cake flour and corn starch to the egg mixture and mix well. Then pour the mixture into a large mixing bowl. Clean out the mixing bowl and then place egg whites into the bowl. Whisk egg whites until triple in volume and then add the 3 tbsp of sugar. Whisk until stiff peaks. Then fold the egg whites into the egg-flour mixture in 3 parts. Pour the batter onto a sheet pan lined with parchment paper and smooth surface with offset spatula. Place in the oven and bake for approximately 10 minutes or until golden brown and cake tester comes out clean. Scald the milk with vanilla bean in a medium sauce pot. Turn off the heat when the milk starts to a boil. Beat the egg yolks and sugar in a stand mixer set to high, until the eggs and sugar form pale white ribbons. Add the corn starch to the eggs and beat for 30 seconds. Temper the eggs by whisking in one ladle of milk at a time until all the milk is incorporated with the egg mixture. Place the egg mixture back onto medium low heat and whisk continually until it thickens. Allow about 10 minutes, but don't boil. In a large bowl mix 2 tbsp of water and powdered gelatin together to bloom. Once the pastry cream has thickened incorporate butter then pour the pudding into a bowl with the gelatin ( the gelatin should melt, and whisk to incorporate well ). Place a piece of plastic wrap on the surface of the pudding so it doesn't form a skin, and place in the refrigerator. Cool completely. Puree strawberries with water in a vita mix. Strain out and put the rest of the ingredients in a small sauce pot. Bring to a boil stirring consistently and cook for 5-7 minutes. Then pour gel into a half sheet pan or baking dish. Place in the refrigerator until the agar has set. Then take a cake ring and cut a round the same size as the cake ring. Take the rest of the gel and place it all into a vita mix and puree until smooth. Pour into a squeeze bottle and set aside until ready to use. This is a quick version of buttercream. Place butter and powdered sugar in a stand mixer and whip until smooth. Add vanilla and a splash of half and half. On a half sheet lined with parchment, use a large cake ring (if desired you can make individual fraisier use a small cake rings) and cut out 2 large sponge cakes. Place one of the sponge cakes inside the cake ring. Take sliced strawberries and place on the inside of the cake ring wall standing up on the bottom layer of the sponge cake. Then fill the center of the cake with the diplomat cream. Then place the second sponge cake on top of the cream and strawberries. Place on top of the second layer of sponge the thin layer of strawberry gel (optional). Then add a small layer of the buttercream on top of the strawberry gel. Place in the refrigerator overnight preferably to help set. Then before serving add the rest of fruit on top with dots of the strawberry gel. Add some fresh mint serve and enjoy! Not your traditional flavored baked alaska here. 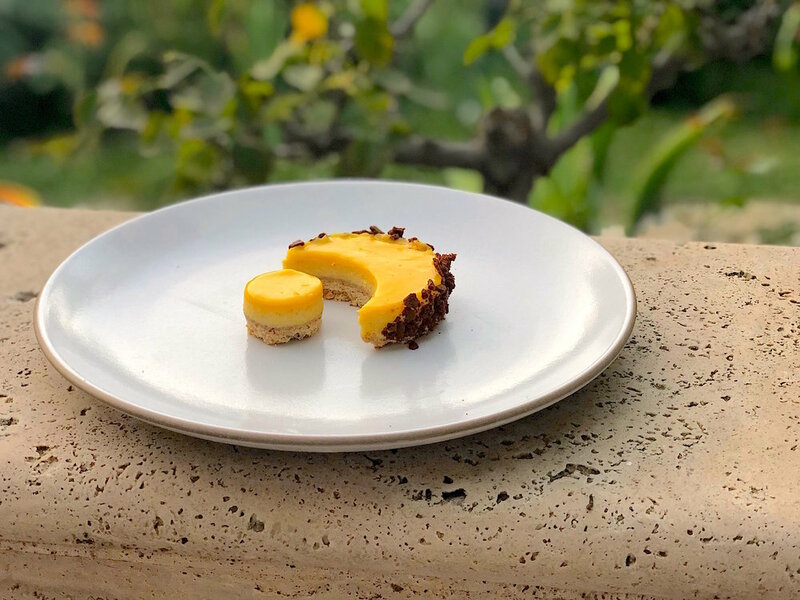 I couldn't resists make a dessert with all of the seasonal passion fruit in California right now. This dessert was the result. Place egg yolks and sugar in a stand mixer and whisk on high for 3 minutes, then add the cornstarch. Meanwhile place all the juices in a pot and bring to a boil. Then temper the eggs with the hot juice. Place the mixture back into a pot and cook over low heat until it thickens. Strain out and cool completely. Place water and sugar in a pot. Bring to a boil and cook for 2 minutes. Then cool slightly and place in a blender with the innards of 12 passion fruit. Puree until smooth, strain through a fine mesh strainer and then chill until completely cold. Place in your ice cream maker according to their instructions. Place in an air tight container and place in the freezer for later. One frozen take a small ice cream scoop and scoop out 12 little sorbet balls on a frozen sheet pan lined with parchment paper. Return the the scoops to the freezer for at least 4 hours. Get an ice bath ready in a large bowl. Place white chocolate in a heat proof bowl. Place coconut milk and cream into a pot, turn on the heat. In a small separate bowl add gelatin and 3 tbsp of water to bloom. Pour the milk-cream mixture over the white chocolate and allow to sit for 1 minute. whisk the mixture completely to melt the white chocolate. Add a little of the white chocolate mixture to the gelatin to dissolve it. Then pour the gelatin mixture back into the bowl of white chocolate and set it in the ice bath. Meanwhile in a stand mixer add heavy cream. Using the whisk start to whip the heavy cream. When the cream starts to thicken add the powdered sugar and vanilla. Whip until stiff peaks. Then when the white chocolate mixture has cooled but not gelled whisk in the whipped cream gently. You want to incorporate the whipped cream well, but you don't want to over work it. Clean out your stand mixer bowl and add the egg whites to the bowl. Whisk on high speed until the whites start to whiten, then add sugar slowly and whisk until stiff peaks. Fold the egg whites into your coconut white chocolate base. Once you have combined it take semi sphere silicon molds and fill. Then take out your scooped passion fruit sorbet and place in the middle of the mousse in the mold. Working quickly using an offset spatula level the molds of the excess mouse. You should be able to see the sorbet, it should be in the middle of the mouse. Immediately place in the freezer overnight. Mix all of the wet ingredients in a bowl together. Then mix all of the dry ingredients together. Mix the wet and dry ingredients together until well incorporated. Pour onto a sheet pan lined with parchment paper. Bake for about 20-25 minutes until done. Take out and cool completely, then place in the refrigerator for 2 hours. Take a ring cutter and cut out 12 rounds that perfectly match the size of the silicon molds. Take the mousse out of the molds and place on top of each cake ring. Place back in the freezer while you prepare the meringue. Place a spoonful of sauce down on the plate. 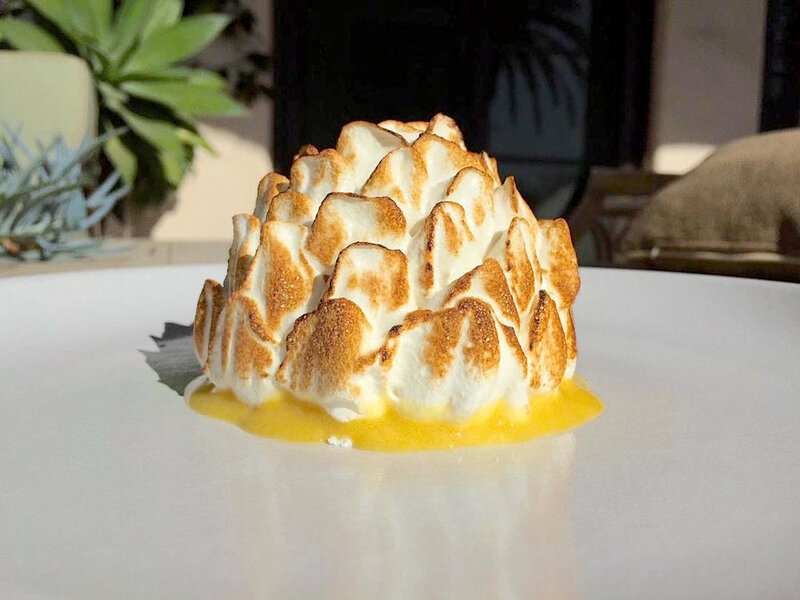 Take a torch and brown the meringue all the way around the baked Alaska. Place on top of the sauce. Serve and enjoy! Here is the classic French flan tart with a little twist of coconut mixed in. This recipe brings me back to walking the streets of Paris, stopping at any of the number of patisseries for a huge slice of the flan. I love this dessert, to me it is almost a mid day snack than a dessert because I could eat this at any time of the day. 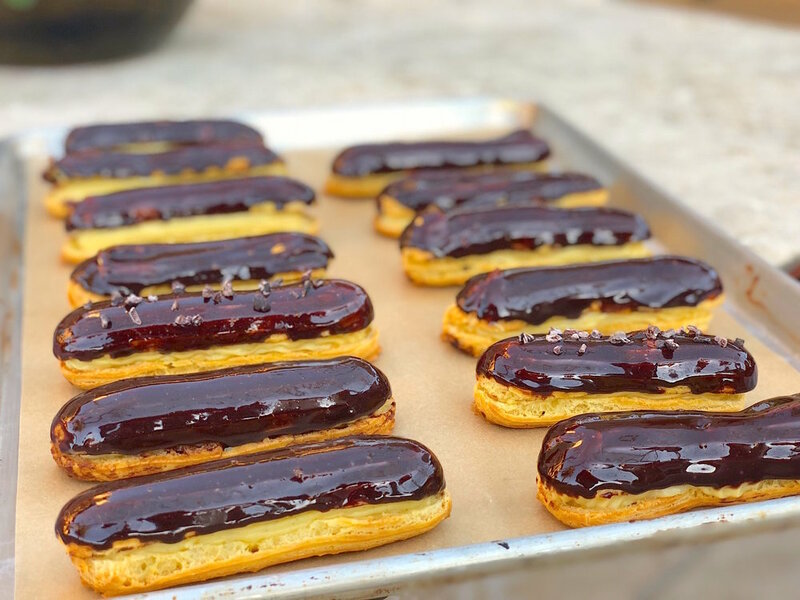 The recipe is adapted from the bouchon bakery cookbook. Here is the recipe I hope you enjoy it! Using the food processor add 2 cups of flour to the bowl along with the salt. Pulse a few times to combine well. Then turn the processor on and begin to add all the butter a tbsp. at a time. Once the butter has been combined. Drizzle in the cold water. Finish with a few tbsp. of flour if needed. Chill the dough for 25 minutes. Roll out the dough, line the cake ring with the dough and place a piece of parchment paper on top., Fill it with raw rice, beans, or baking weights. Bake for 35 minutes, or until the edges of the dough are lightly browned and the bottom is set but still light in color. Remove the parchment and rice (store the rice for future use). Set the pan on a cooling rack and cool completely. Place the eggs, yolks, and sugar in the bowl of a stand mixer fitted with the whisk attachment and mix on low speed for about 30 seconds to combine. Scrape the seeds from the vanilla beans, add them to the egg mixture, and mix on low speed for about 30 seconds to distribute the seeds evenly. With the mixer running on the lowest setting, add the custard powder and the cornstarch and mix for 30 seconds to incorporate. Scrape down the sides and bottom of the bowl. With the mixer running on low speed, slowly pour in the milk. Pour the mixture through a fine-mesh strainer into a large saucepan. Place the pan over medium-high heat and bring to a boil, whisking gently to prevent air bubbles. Boil for 1 minute, rotating the whisk around the edges of the pan to keep the mixture from scorching. Pour the mixture through a fine-mesh strainer into the bowl of the mixer. Fit the mixer with the paddle attachment and mix on low speed for about 3 minutes to release steam and cool the mixture slightly. Then pour the custard into the tart shell and bake for an hour and half to hour and forty minutes. Take out and cool overnight. Slice and enjoy! Here is a little twist on the classic opera cake which normally consists of chocolate, coffee, almond sponge cake. 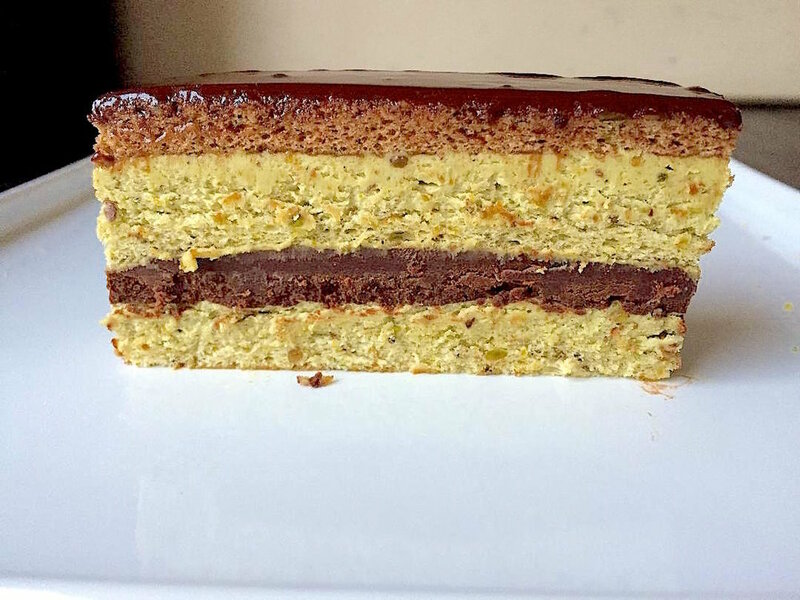 I made it with pistachios and chocolate with different variations of each. If you love pistachios and chocolate you will love this dessert. This is a dessert I made a few weeks ago that was a huge hit. I served it with pistachio ice cream. Pretty straight forward baking for this dessert, it just has a several steps to the layers. Not hard though. Here is the recipe I hope you enjoy it! Place eggs, yolks, and 111g sugar into a stand mixer. Whisk until thick and pale yellow about 5 minutes. Then add the flour, pistachio flour, and almond flour to the egg mixture and mix well. Then pour the mixture into a large mixing bowl. Clean out the mixing bowl and then place egg whites into the bowl. Whisk egg whites until triple in volume and then add the 3 tbsp of sugar. Whisk until stiff peaks and add pistachio extract. Then fold the egg whites into the egg-flour mixture in 3 parts. Pour the batter onto a sheet pan lined with parchment paper and smooth surface with offset spatula. Place in the oven and bake for approximately 10 minutes or until golden brown and cake tester comes out clean. Same process as the pistachio sponge. In a small pot add cream and bring to a boil. Place chocolate in a heat proof bowl. Pour the hot cream over the chocolate. Wait 1 minutes and then mix well with a whisk until the chocolate is completely smooth and melted. Allow to cool to room temperature. This is a quick version of buttercream. Add butter, powdered sugar, along with pistachio paste to a stand mixer bowl. Mix with a paddle attachment 2-3 minutes until smooth. Add a drop or two of pistachio extract and mix well. In a small bowl bloom gelatin powder in 3 tbsp of water. Place sugar, water, cocoa powder, and cream in a pot and turn on medium heat. Stir regularly until it comes to a boil. Then add in the chocolate. Stir until completely combined. Then add in the gelatin and stir until smooth. You can use the glaze immediately if you want or you can save the glaze for another time, just bring the mixture up to 110 degrees before using. You can either cut your sheet cake in half or in thirds depending on how big you want your cake to be. If you don't want any waist you can cut in half. Place the pistachio cake on the bottom and then spread a layer of the pistachio buttercream on top. Then place a piece of the chocolate sponge on top. Add a layer of the ganache on top and spread evenly. Add another layer of the pistachio sponge and butter cream. Then top off with the last layer of chocolate sponge and ganache. Chill for a few hours and then pour the mirror glaze on top for a nice finish. Accompany the cake with a side of pistachio ice cream. Serve and enjoy!